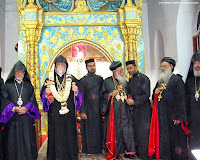 KOTTAYAM: His Holiness Aram I, the Catholicos of the Holy See of Cilicia of the Armenian Apostolic Church visits Malankara Orthodox Church from February 24-28, 2010. Metropolitan Dr. Gabriel Mar Gregorios of the Thiruvanthapuram diocese visited the Armenian Catholicos at the Catholicate Palace in Antelias and extended the official invitation of the supreme head of the Malankara Church at the end of January 2010. The visit of Aram I to India is in response to this invitation. The Holy See of Cilicia is one of two wings of the Armenian Apostolic Church. Since 1930, it has been headquartered in Antelias, Lebanon. 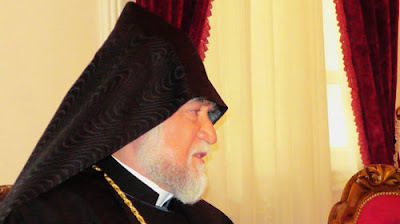 Aram I has been the Catholicos of Cilicia of the Armenian Church since 1995. Armenian Apostolic Church comes under the family of Oriental Orthodox Churches. 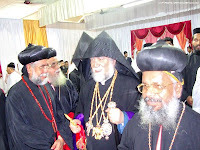 The supreme head of the Armenian Church will reach Kochi on February 24 and will officially meet with Baselios Marthoma Didymos I, the Catholicos and Malankara Metropolitan at his headquarters, Devalokam Aramana. Thereafter Aram I will participate in the banquet hosted by Baselios Marthoma Didymos I in honor of the visiting Catholicos. His Holiness Aram I is Catholicos of the See of Cilicia of the Armenian Apostolic Church (Antelias, Lebanon). He was elected moderator of the WCC Central Committee at the Seventh Assembly (Canberra 1991) – the youngest person ever to be chosen for that position – and was re-elected at the Eighth Assembly (Harare 1998), and he is the first moderator to be re-elected since Franklin Clark Fry in 1961. Ordained a priest in 1968, Aram Keshishian was named locum tenens of the diocese of Lebanon in 1978 and primate in 1979, and was ordained as a bishop in 1980. In 1995 he was elected Catholicos. He has studied theology – specializing in philosophy, contemporary systematic theology and Middle Eastern church history – at his church’s theological seminary in Antelias, Lebanon, the Near East School of Theology (Beirut), the American University of Beirut, and Fordham University (New York), from which he earned a Ph.D. in theology. He also attended the WCC’s graduate school of ecumenical studies in Bossey, Switzerland, and has done theological research at Oxford University. In 1975 he was named to the WCC Faith and Order Commission. He was a delegate to the WCC’s Sixth Assembly (Vancouver 1983), where he was elected to the Central Committee. He played an active role in the founding and re-structuring of the Middle East Council of Churches. He is a member of the Oriental-Eastern Orthodox and Oriental Orthodox-Roman Catholic Bilateral Dialogues. He is an honorary member of Pro-Oriente, a Roman Catholic Ecumenical Foundation located in Vienna. He has written a dozen books in Armenian and English about the Armenian Church and about ecumenical issues. An abridged version of his doctoral dissertation was published in 1990 under the title Conciliar Fellowship: A Common Goal (Geneva, WCC Publications, 1990). His most recent book is a collection of essays entitled The Challenge to be a Church in a Changing World (1997). Feb. 26 Friday : Participate in the Holy Synod at Old Seminary. Face to face with Seminary Students. Evening at Puthuppally Church. 8pm attend the Banquet with Dignitaries and religious leaders.